DPS Literacy Summit on May 3rd--Amazing opportunity to help our kids! Join DPS and the Durham Community in addressing the literacy crisis in the Durham Community at the 2014 DPS Literacy Summit on Saturday, May 3 from 9:30-1:00PM at Brogden Middle School. We have a literacy challenge in the Durham community and across NC. Across the state, schools are addressing the impact of the new Read to Achieve Law, which requires 3rd graders who are not reading on grade level to attend summer reading camps and face being retained. This will impact around 900 third grade students in Durham. We want to address literacy for our elementary students this summer and throughout the school year. Your help is needed! Adults and Youth volunteers, including parents and middle and high school students, who are interested in helping kids with reading either in the schools or community are invited to attend. DPS is encouraging church and community tutoring, after school, summer, mentoring, preschool, and other programs to send your volunteers to get this FREE training that groups can use with the kids they already serve. There is room for at least 500 attendees, so you can bring your friends, youth, all your volunteers or whole staff. Every attendee will receive training in at least 3 of the Big 6 skills that we can all use to help our K-3 readers (and older PreKs too). Please see the attached flyers in English and Spanish and distribute them widely and invite others you know. You can use what you learn in the community work or volunteer to be a summer reader for the DPS reading camps or anytime throughout the ear. Registration is requested, but not required. Breakfast, Lunch, and childcare are offered. Spanish Translation is available. Please spread the word. This is NOT an “all talk, no action” summit. WE are the action and our kids and schools need us to be there. We will be there, hope to see you on May 3rd! This Saturday, April 5th--Great Opportunity for Family Fun at Wheels, Enter to Win a Car, and Support the Exchange Family Center! The Exchange Family Center is holding a PinWHEELS for Prevention event at the Wheels Fun Park on Sunday April 6, 2014 from 12:00 p.m. to 6:00 p.m. If you buy a raffle ticket, you could WIN A CAR! The event is being held during April, which is National Child Abuse Prevention Month. They are trying to raise awareness about child abuse issues AND much needed funds to help them meet the needs of the community. The Exchange Center currently has more than 80 families on a waiting list. Go to http://www.exchangefamilycenter.org/#!pinwheels-for-prevention/ctvt to buy your tickets and raffle tickets! 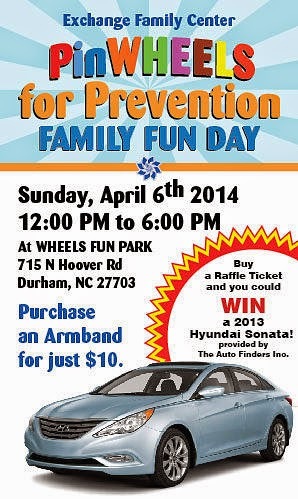 You can also buy tickets from their staff or at the office located at 3708 Lyckan Parkway, Suite 103, Durham 27707. Tickets will also be available at Wheels on Sunday. Bring a flyer or email to show you came for this special event. The weather should not include snow or ice so get outside and have fun!